Folia Grill took me away this weekend. Sun, sizzling meat, olives the size of coconuts, and clean crisp beer are the things of summer in Greece, and after popping into Folia Grill, I felt like I'd been taken on a mini cheap eats cruise to the Mediterranean. Opened last October in the heart of Pape Village, owners George and Eleni Moschopoulis explain that with Folia they're trying to emulate the curbside diners of Greece; social hubs that offer a few signature dishes and do them right. For the husband and wife team this means sourcing veggies from local growers and olive oil from a friend in Tripoli - and making almost everything from scratch. 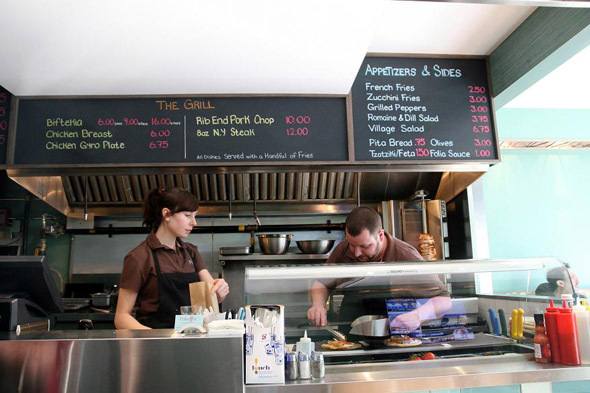 Located in a newly renovated space with floor-to-ceiling windows and a plasma screen, Folia looks more yoghurt bar than diner, but the menu is classic Greek (biftekia, gyros, souvlaki etc). With just a dozen items, patrons aren't spoiled for choice, but with everything except the NY Steak coming in at under $7.00 it means you can try a bit of everything - which is exactly what my wingman and I decide to do. 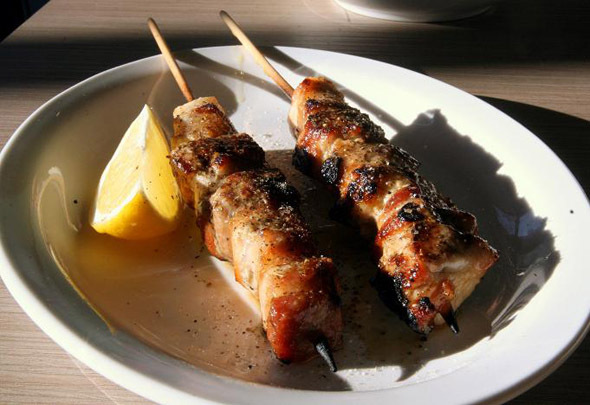 My excitement begins after learning the pork souvlaki sticks ($1.75) are made from pork belly, one of my favorite cuts. When I ask why this isn't mentioned on the menu I'm told some patrons are put off by the less conventional cut. Pity the fools, I'll take two. A plate of olives ($3.00), home-made tzatziki ($1.50), pita (at $0.75, a steal) and some Mythos Lager ($4.00) start things off nicely. The sun is shining, the beer is cold, and as the starters arrive I'm in the mood to eat. The plate of nefplion olives are plump, proud specimens, imported from the motherland and bathed in a vibrant green olive oil. 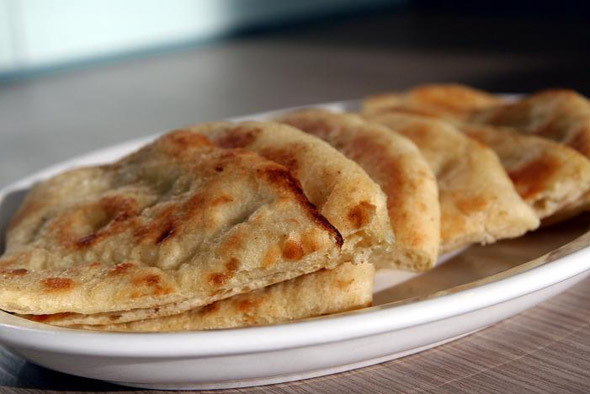 They have a dense, chewy texture and a bitterness cut by the fruity oil, that I proceed to mop up with the butter dusted, still warm pita. The tzatziki is rich and refreshing without packing too much of a garlic punch. I've barely had time finish dipping when the souvlaki arrives. Lustily seasoned and served with a slice of the lemon, the twin skewers glisten before me as I cleanse my palate with the lager and dive in. There's something primordial about tearing meat off a stick, and I greedily shear the belly from the blackened skewer, the chewy flesh giving way to the unctuous fatty inner as the charcoal, sea salt and lemon take turns kicking my taste buds around. It's the type of snack you might have in a small village and remember the rest of your life. Slowing things down my co-taster and I order the village salad ($6.75) and zucchini fries ($3.00). Hand cut slices of zucchini lightly breaded then fried are served piping hot with a side of spiced mayonnaise. 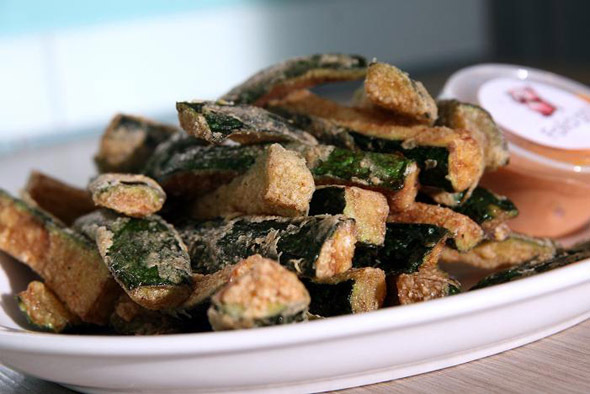 I crunch into the finger-sized fry and am greeted with a wonderful whoosh of zucchini. A favorite snack in Greece, I can only hope they take off here as I fight my lunchmate down to the last stick. Best eaten hot, the accompanying mayo isn't necessary as the fries speak for themselves. 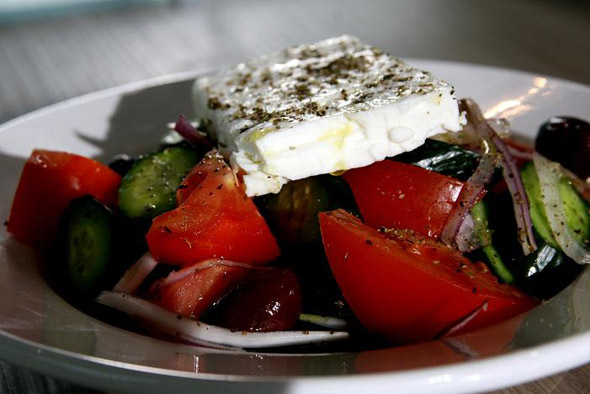 The salad, made to order, comes topped with a slab of feta sprinkled with oregano. Beneath lie crisp Lebanese cucumbers, red onion, olives from Eleni's grandmother's backyard and tomatoes riper than they ought to be at this time of year. 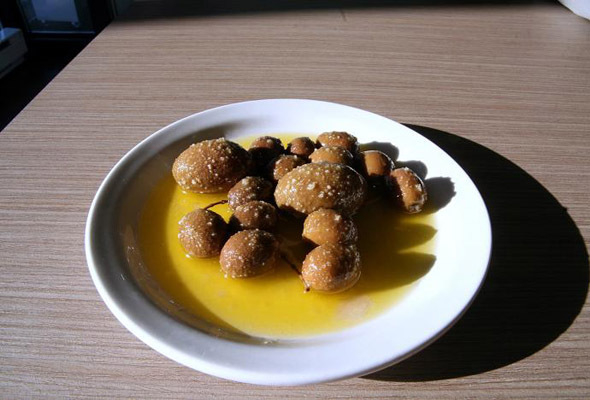 Drizzled with the gutsy olive oil from Tripoli, it's a simple, satisfying affair made with top notch ingredients, and a timely respite from the hearty fare that's been slapping us around. But I've still to try Folia's signature dish: the Chicken Gyro Pita ($4.00). The predictably large parcel arrives nonchalantly enough, but as I tuck into the gyro I know Foila has saved the best till last. The chicken is juicy, sweet and good enough to be eaten alone, but when teamed with the tomatoes, onions and tzatziki becomes something greater than its parts. It is a meal that tastes of Greece itself: grilled meat, ripe tomatoes and tzatziki. Too much to handle all at once, it demands to be slowly savored. As the plates are cleared and I finish off the last of the Mythos, my equally stuffed co-diner and I agree we've just had a home-cooked meal, not fast food. And as I notice several regulars popping in for their daily meaty fix, I wonder if George and Eleni aren't well on their way to creating a classic curbside restaurant. So as the weather turns fair set your sails to Folia Grill - you won't get closer to Greece in Toronto at these prices. Writing and photos by Daniel Kuseta.